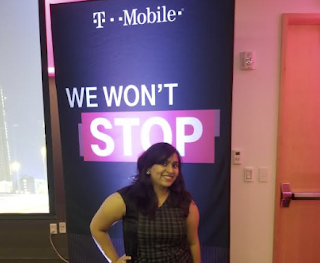 Mohini-Anne D'souza and her internship experience at T-Mobile Inc.
It’s been one complete year since my arrival into the United States of America. As I sit down to reflect upon my journey this past year, I cannot help but be surprised at how far I have come. To those who are just beginning their journey here, let me just say that it may look daunting in the beginning, but everything sorts itself out in the end. The key to ensuring that success is hard work and persistence. So clichéd, isn’t it? But trust me when I say, it’s not the kind of hard work and persistence as you’ve seen before. Everyone tells you how important it is to get an internship, how that provides a window of opportunity to a full-time job; the proof to that statement lies in so many of our past seniors’ experience. Career Fairs are not to be taken for granted; networking with people having good contacts in the industry is a must; staying in touch with them and being persistent is a needed effort. Keeping your LinkedIn and resume updated is a supposed to be a monthly, if not weekly feature. And amid all this, ensuring to keep your grades up! Like I said, not the kind of hard work and persistence as you’ve seen before. No one tells you exactly how to do all of what I have mentioned above. It’s a continuous self-learning process. My whole of Spring was spent in doing as much of networking and applying to as many jobs as possible. My initial search for an internship opportunity in the wireless domain was turning out to be futile; so, I widened my scope and began applying for jobs in the networking and softwar e domain. Nearly every day I would wake up to rejection emails with the typical lines like - “We have assessed your skills but unfortunately you were not selected for this position....”. Come May and I have hardly received any hopeful calls or emails. I was beginning to look at other options (research, for example) and other ways to spend my time productively in the summer. There are a few perks of being from the Clark School of Engineering (especially, the telecommunications department). One of them is having department heads, like Professor Zoltan Safar, who take the effort to email every job opportunity that they come to know of to every student in the department. That’s how I came to know of the job opportunity at T-Mobile: The Government Affairs Office in DC was looking for a Radio Spectrum Intern with an engineering background to assist in the repacking process of 600MHz spectrum that they recently acquired in the reverse auction conducted by the FCC in April. I quickly dropped a mail to the hiring manager, providing information about my resume and my interest in the wireless domain. About one week later, I received a reply from the HR asking me if I would like to talk to him about the internship opportunity. My entire interview process took hardly four to five days. I had an interview call with the HR on Friday and the following Tuesday I had a corresponding call with the hiring manager and my would-be supervisor. By evening of the same day, I was told that I had received the job offer. I have worked in a multinational corporate company in the financial sector before, but this was an entirely different ballgame altogether. The ease and comfort with which people conduct meetings and conference calls is something to look forward to, the working environment is an oxymoron of sincerity and fun, and all-hands meetings are always served with delicious food. I got to learn a lot during my summer: how an organization conducts its business, how it keeps up with its competitors and the interface between the technical and business. For the technical aspect, I ended up retracing my steps to my undergraduate and graduate courses in RF engineering and cellular communication. The software I worked involved performing interference analysis on deployable cell sites. That meant having in-depth knowledge of cell-site designs and antenna parameters. Basically, I was able incorporate whatever I had studied or learnt into my internship. The most amazing and memorable experience from all of this was when we got the chance to fly to the headquarters in Bellevue, Washington. The purpose of our visit was to explain and transfer our knowledge about the interference analysis software that we were working on. We demonstrated an optimized and faster deployment of cell sites under 600MHz. We were also given the opportunity to sit in the all-hands technology meeting and witnessed the deployment of the first 600MHz sites in Cheyanne, Wyoming. I am happy to say that I have been given the opportunity to work during the fall as well for T-Mobile. I think this one of my best working experiences and I very much look forward to continuing my work here at T-Mobile. #BeMagenta!